Every single user while thinking about changing operating system, in particular Windows to Ubuntu, tries to make sure that new OS will allow him/her to do everything he/she got used to, i.e. it won’t lack functionality. As you remember, we had already reviewed Microsoft Office and Instant Messaging Clients alternatives for Linux distributions, so now it’s time to check how things stand in the other aspects. In the given post we are going to find out if Ubuntu multimedia capabilities are decent enough to be compared with the ones of Windows. It’s quite an understandable fact that each of you has favorite apps for movies, music, Internet radio and so on. Moreover it can be just one single app, which you really like, thus willing to get at least comparable alternative. Fortunately there are a lot of things to choose from, so you can easily find the one corresponding to all your needs. As you understand the amount of programs deserving attention is much bigger, so if you encountered a nice app that wasn’t included in the list, please let us know. Amarok represents a very popular media player known by its great functionality and usability. One of the coolest feature of this app is Web services integration, which allows you to access music directly, significantly expanding the number of songs you can listen to. The services you can connect to are: Last.fm, Magnatune, Ampache, Librivox, MP3tunes, Shoutcast Radio, Jamendo, and OPML Podcast. Still you can easily add other services as well. In addition to that Amarok is a cross-platform player, so you can download Windows or MacOS version to give it a try (if you’re not using Linux yet); however it should be mentioned that those versions are for testing purposes only, because there is no official support yet. If you would like to get see more screenshots, please visit this page. multilingual support (more than 45 languages) and etc. Unfortunately there is no way to watch movies with this app. However for justice sake it should be emphasized that this is the only drawback which prevents Amarok from being all-in-one media player. On June 17, 2009 the latest version of Amarok — 2.1.1 «Oceania» – was released. You can download it here. Nevertheless there is an easier way to install it: Applications — Add/Remove — Search for «Amarok» – Choose it — Apply changes. 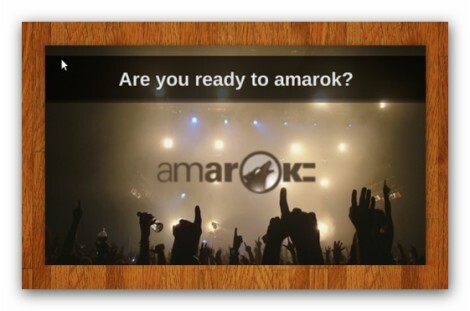 To start the application go to: Applications — Sound and Video — Amarok. 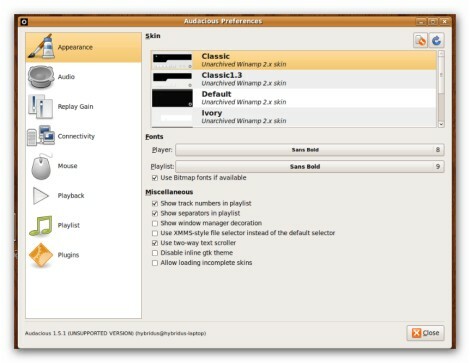 Audacious is an advanced audio player, which is focused on audio quality, supporting a great deal of audio codecs. Audacious is extendable through plugins, and contains other useful features like LIRC support and support for Last.fm. It has a nice looking design which is very similar with the one of well-known Winamp for Windows; moreover it even supports some of Winamp skins, but not the modern ones. As it was mentioned before the nice thing of Audacious is opportunity to implement a lot of features by using plugins. If you would like to check the full list of available plugins, please visit Features and Plugins pages. Given player, as you probably have already understood, does not support video as well. However in the other aspects it’s pretty decent, so you should check it for sure before making the final decision. Finally it should be emphasized that Audacious can be installed from Add/Remove panel (as in previous case), but in this way you won’t be able to get the latest version. Thus if you really like to have the latest and greatest version, you should download it from the official website.